Orinoco Flow was featured in Sandra Salamony's publication 1000 Jewelry Inspirations, but somehow, I never ended up doing a tutorial for it. I only have a few step-out photos, but even though it looks complicated, it isn't really that hard if you've got some basic bead embroidery skills already. 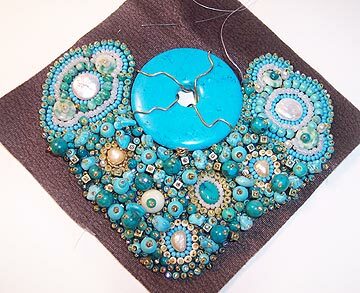 The center piece of turquoise was wrapped with wire as shown, and then was stitched to the foundation fabric (ultra-suede) around each wire. I cut out the portion of fabric that showed through the center of the donut, and later also cut through the backing fabric in the same spot. After I stitched down all the cabochons, I surrounded them with various numbers of rows of back stitch. Then I began to fill in all the gaps with short stack stitches. 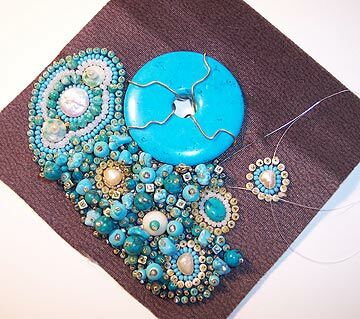 Besides seed beads (sizes 8/0, 11/0 and 15/0), I also used turquoise, amazonite, and pearls. I used bright gold size 15/0 seed beads as stoppers on the top of each stack stitch so that there would be unity in the piece. When the piece was fully stitched, I cut it out with a 1/8 inch edge, and then stitched the front to some backing fabric with edging brick stitch. 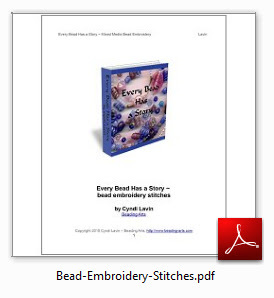 All of the stitches I used can be found in the free chapter of my e-book Every Bead Has a Story. Go get yourself a copy if you don't already have it! To assemble the final necklace, I added the dangles from the center on beading wire, used the edging brick to anchor the beaded portions of the straps, and added picots with size 15/0 seed beads through the rest of the edging beads around the outside. I used smaller wired donuts to attach the multiple strand beaded portions of the straps to the single strands. The chain makes it adjustable. 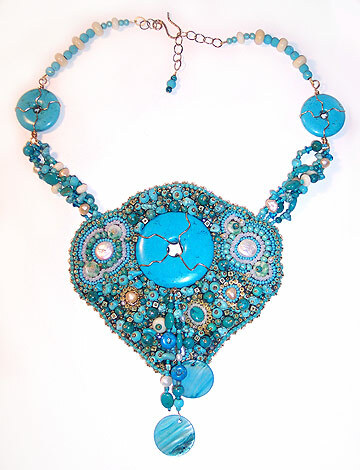 This necklace will take you many hours to make (I think it took me about 30 hours) but it is oh so worth it!